Arizona Memorial, a photo by Southworth Sailor on Flickr. 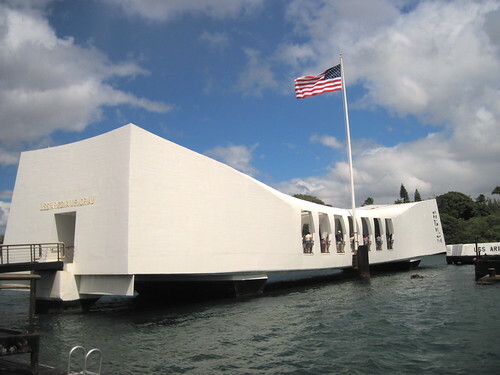 One of the reasons that we made sure that we spent some time on Ohau was so that we could go to Pearl Harbor. Hoping that the crowds waiting for USS Arizona tickets would be fewer on Monday morning, we waited until the last morning of our stay in Ohau. With an early start, we were fortunate and got tickets for a morning tour. We enjoyed the whole Pearl Harbor museum. With all goals for Ohau accomplished, we headed for the airport on the early side. We ended up waiting all afternoon for our island hopper. We knew we were in for an adventure when the ticketing agent was gone for plane detail. We had no idea when we booked the tickets, that Pacific Wings was basically a 'bush plane' We watched all afternoon while plane after plane of other travelers boarded big prop planes for Maui, while we waited for what we weren't too sure of. The departure time came and went with no sign of a plane. The nine passengers assembled at the gate started rolling their eyes. Finally, the pilot and copilot (aka baggage and flight crew) ushered us down the tarmac to a small well used single engine Cessna. We were each given specific seats based on our weight. Yes, we gave the ticket agent our body weight. The flight ended up being a real joy as the plane stopped at Molokai and then flew low along the cliffs to Maui. (Check out some of the pics on my flickr link above) We found 'our condo' easily and we are settling into it this evening, listening to the loud crashing of waves. Yikes! You would not catch me on that plane! Looks beautiful though!